Bikes are the most energy-efficient form of transport and can be faster and more predictable than car or bus for short journeys. For example, at a relatively comfortable 10mph, you can cycle from Green Park to The Oracle in 15 minutes - burning around 100 calories in the process. Cycling regularly can keep you fit, save you money (no tax, no fuel, no fares) and it's one of the most environmentally-friendly ways to travel. 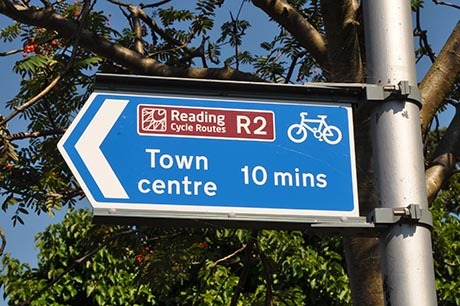 This site provides information on the Reading Cycle Routes network, that connects all of Reading's major facilities, employment, shopping and leisure destination, and other cycling facilities and services that are provided within the Borough by the Council and by others. Information on cycling to many different destinations in Reading can be found in the destination pages for those locations. There is good advice on locking your bike, how to stay safe, riding for leisure and getting the kids started on their bikes.